NYLCVEF’s nonpartisan electoral activities usually take place leading up to an election and seek to educate voters and candidates on the critical connection between elected office and environmental protections and by encouraging environmentalists to vote. Activities include candidate forums, “get out the vote” campaigns, and environmental candidate schools that educate prospective politicians on environmental issues and the importance of adding them to their campaign platform and legislative agenda. From the Hudson River to Long Island Sound, Westchester County is on the forefront of many sustainability challenges. The Westchester County Executive plays an important role in fixing old sewage treatment plants, protecting open space and getting our county ready for a changing climate. But where do the candidates running for this important office stand on these and other environmental issues? On Sept. 24, 2013, NYLCVEF and Pace Law School hosted the first-ever Westchester County Executive Forum on Sustainability to find out. The event featured appearances by current County Executive Rob Astorino and challenger Noam Bramson, as they seek election to the post on Nov. 5, 2013. The candidates answered a wide range of questions on environmental issues, from climate change and parks funding, to Indian Point and the Hudson River. If you missed the forum or would like tor relive the action, click here to view a video recording. On July 18, 2013, over 120 people filled the Irondale Theater in Fort Greene, Brooklyn, for a City Council candidate forum on sustainability issues. The New York League of Conservation Voters Education Fund and Transportation Alternatives sponsored the lively debate. Additional support was provided by a host of local civic groups. Many candidates from the crowded race for the Democratic nomination in District 35 were in attendance, including Olanike Alabi, Laurie Cumbo, Ede Fox, Richard Hurley and Jelani Mashariki. NYLCVEF President Marcia Brystryn was the evening's emcee and moderated the event alongside Noah Budnick of Transportation Alternatives, Deborah Howard of the Pratt Area Community Council and James Subudhi of the Brooklyn Movement Center. District 35 provides a compelling example of the kinds of sustainability challenges that face New Yorkers throughout the five boroughs. Development issues are of particular importance, as residents have recently grappled with the benefits and drawbacks of major development projects like the Barclays Center and the attendant commercial development along Atlantic Avenue. The candidates debated a range of related issues, including the expansion of local bus routes, the viability of additional pedestrian plazas and bike share locations, and the rezoning of previously industrial areas for new economic purposes. The conversation provided attendees with a robust perspective on the candidates' sustainability positions ahead of the September primary. Scores of Bronx residents turned out at the Bronx Library on July 22, 2013 for NYLCVEF's District 15 City Council Forum. Those in attendance heard candidates including Kenny Agosto, Albert Alvarez, Raquel Batista, Joel Rivera, Cynthia Thompkins and Ritchie Torres articulate their positions on important sustainability issues facing the district. The forum was hosted by the New York League of Conservation Voters Education Fund, alongside Bronx Health Reach and the Mary Mitchell Family and Youth Center. It was moderated by the Education Fund's Marcia Bystryn, as well as Kelly Moltzen from Bronx Health Reach and Lili Hurley from the Mary Mitchell Center. District 15 encompasses Bathgate, Belmont, Crotona, Fordham, East Tremont, Van Nest and West Farms. Food policy, air quality and affordable housing were all important issues for the audience. Food quality was a particularly pressing concern, and a frequent topic of discussion. Attendees voiced their demand for more healthy, local food, and all of the candidates emphasized the vital importance of creating better food policy for a more sustainable community. Scores of Southeast Queens residents came to St. Peter's Lutheran Church in Rosedale on July 11, 2013 for a City Council candidate forum on sustainability. The candidates running for District 31 who were in attendance included Herbert Binger, Michael Duncan, Scherie Murray and incumbent Councilman Donovan Richards. The forum was co-hosted by the Eastern Queens Alliance, a prominent civic umbrella group in the borough. EQA chairperson Barbara Brown and NYLCVEF President Marcia Bystryn moderated the lively exchange. District 31 faces critical choices on a range of sustainability issues in the 2013 municipal elections. The district includes Far Rockaway and many parts of the Jamaica Bay floodplain, areas still struggling to rebound from the effects Hurricane Sandy. Other sustainability issues that face the district are the sparse public transportation options, air, water and noise pollution created by John F. Kennedy International Airport, and the protection of Idlewild Park from illegal dumpers. The candidates highlighted their personal and professional experience with the issues and outlined their strategy for a more sustainable and healthy future. Scores of Queens residents turned out in Jackson Heights on Monday for the first-ever Queens Borough President Forum on Sustainability. Five candidates, including Tony Arcabascio, Tony Avella, Leroy G. Comrie, Melinda R. Katz and Peter F. Vallone, Jr. spoke. The event was a rousing success, and was co-hosted by the Jackson Heights Beautification Group. The forum was moderated by JHBG's Edwin Westley and NYLCVEF President Marcia Bystryn. Queens currently faces a number of unique environmental challenges-particularly in the aftermath of Hurricane Sandy. The next borough president has the potential to play a critical role in making the borough a sustainability leader. All of the major candidates came to share their beliefs on these important challenges, and welcomed questions from audience members. A wide variety of sustainability issues were discussed-including transportation, green jobs, solid waste management, parks funding, climate change and more. One item of discussion, the planned CitiField mall, was covered in the NY Daily News. You can view our photo gallery from the event here . The forum was just the latest step in NYLCVEF's ongoing campaign to elevate the dialogue around sustainability issues in New York City, both in the current election cycle and in the long term. 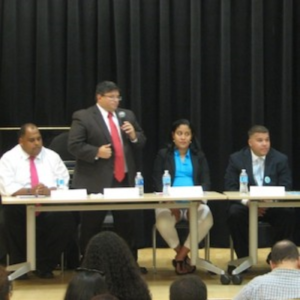 We look forward to hosting additional forums in all five boroughs throughout the summer. We would also like to thank our many partner organizations from throughout the borough for their participation and support. NYLCVEF's Harlem City Council District 7 forum on July 9, 2013 was a great success, continuing the initiative to inform voters on candidate's environmental views. Scores of local residents made their way to the Convent Avenue Baptist Church for a memorable discussion on sustainability, hosted by the Education Fund as well as WE ACT for Environmental Justice. Nine candidates were in attendance, including Alicia Barksdale, David Sasscer-Burgos, Brodie Enoch, Christina Gonzalez, Joyce Johnson, Mark Levine, Mark Otto, Zead Ramadan and Ruben Dario Vargas . The panel presented their opinions on a large range of issues encompassing green infrastructure, environmental education and transportation, touching even on issues of public housing and stop-and-frisk. The forum was moderated by Peggy Shepard, Executive Director of WE ACT, and Marcia Bystryn, NYLCVEF President. NYLCVEF organized the first-ever Albany Mayoral Forum on Sustainability took place on July 2, 2013. Scores of local residents turned out at WAMC’s The Linda and countless others listened online as the major candidates discussed their views on the sustainability challenges facing Albany. The forum also garnered significant press coverage, including in the Albany Times Union, WAMC and the Schenectady Daily Gazette. To listen to the complete forum, click here. You can also check out our photo gallery. There was no shortage of debate between the candidates, even confrontation at times. Topics ranged from the issues of backyard chickens to land banks and much, much more. The Albany Mayoral Forum on Sustainability was a great success with the help of our co-host, WAMC. The forum was moderated by WAMC’s Dr. Alan Chartock and NYLCVEF President Marcia Bystryn. Well over a hundred New York City candidates, their staffs and civic leaders from every borough participated in the NYLCVEF's Environmental Candidate School on May 11, 2013. Participants heard from organizations ranging from WE ACT for Environmental Justice, to Transportation Alternatives, to the Center for Working Families to get the latest information on sustainability policies that will help them campaign and govern effectively. We also presented the candidates with our 2013 New York City Green Guide to provide useful information about the issues and the experts working on them. Click here to check out the photo gallery from this event. The Environmental Candidate School's final panel featured current City Council members sharing their insider's perspective on how City Hall works, from budget-passing to law-making. Candidates asked insightful questions about how to solve environmental problems in their communities, and followed up with advocates at the conclusion of each panel. NYLCVEF also handed out a Green Guide for candidates looking for more information about working towards a sustainable future in New York City. Following our recent (and very successful) Mayoral Forum on Sustainability, the Environmental Candidate School is the latest salvo in the NYLCV Education Fund's New York City Sustainability Program. Keep an eye out for more forums and educational campaigns in the coming months as we work to make sustainability a top priority for the Big Apple. Following our successful citywide Mayoral Forum on Sustainability, the New York League of Conservation Voters Education Fund this week partnered with The Riverdale Press and the Riverdale YM-YWHA to host the West Bronx Green Mayoral Candidate Political Education Forum in Riverdale. Over 100 people attended Monday night's forum, which was moderated by NYLCVEF President Marcia Bystryn and included panelists Eric Goldstein, Yael Levy and Barry Willner. Mayoral candidates Christine Quinn, Sal Albanese, John Liu and Adolfo Carrion fielded questions about a wide range of environmental issues, including open space, energy, waterfront access and the Hudson River Greenway. On May 21st, NYLCVEF will participate in a West Bronx City Council Candidate Forum, where we'll cover sustainability issues affecting the West Bronx with City Council candidates. On Tuesday, November 8th, voters on the East End of Long Island had an important environmental decision to make on their ballots: whether or not to extend the Community Preservation Fund (CPF) in the five East End towns. Voting is the most powerful way to ensure your leaders represent your values.